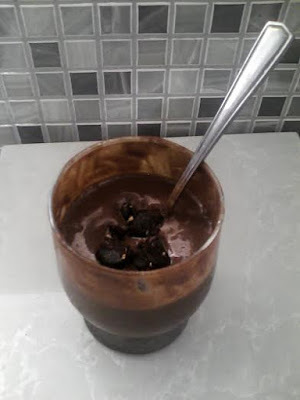 My Birthday Chocolate Smoothie with Brownie Bites! - No Way That's Healthy! Yup, that is what I am singing today! 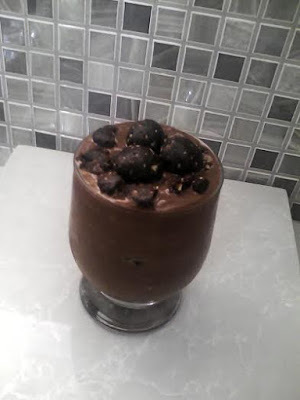 This chocolate smoothie is seriously indulgent and the brownie bites really take it over the top. You need to make this. And don’t worry it doesn’t need to be your birthday to have it, but it does make your day a whole lot better. So enjoy it any day of the week. *The night before I scooped out tablespoons of pumpkin puree onto a pan and froze. I then used four of them for this smoothie. Also, if pumpkin sounds too crazy for you, frozen banana will work great here. I just did not want any banana flavor in this smoothie. **You can use any nut butter of choice or do without. The nut butter adds creaminess. Put all the ingredients into the blended and blend till smooth. To make the smoothie thicker you can add in the xantham gum. I couldn’t locate mine, but I am sure it would help to make the smoothie thicker. Also add in the milk slowly so it does not become too thin. In a food processor, blend the cashews and almonds till they are small almost fully ground up pieces. Add in the dates, salt (if using), and cocoa powder. Blend again till combined. If it is still crumbly add in the water. When you pinch a small piece of the dough together and it holds without falling apart, it is ready. Roll into small ball shapes or just push down into a small pan. Place in the freezer or fridge to firm up. Place a few brownie bites into the bottom of your cup. Pour in the chocolate smoothie half way and then add a few more brownie bites. Top with more smoothie and finish with even more brownie bites. I enjoyed this with a spoon. The combo of the brownie bites and the smoothie was amazing. Happy Belated birthday! Please GD you should forever be so creative!